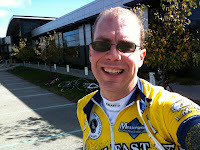 Yesterday, October 2nd, was the Tyranena Brewing Company's Oktoberfest bike ride around Lake Mills, Wisconsin. With Autumn in full swing, I expected a pleasant ramble through the changing leaves of Southern Wisconsin, between Madison & Milwaukee. It was breezy, veritably blustery save blue skies, with winds around 20 mph. We set out amongst the clumps of 1750 riders, Jeff, Ed and I together, leaving Jan, Nancy and Kim to ride their own ride. It was pleasant enough to be begin. Some rolling hills greeted us, but the legs were still fresh. I'd applied Mad Alchemy's embrocation before the ride hoping for a pleasant warmth on my legs, feet and lower back as the temperature was just north of 50 degrees. I'd grabbed my favorite bike, my custom John Cherry steel frame wearing Campy Chorus, Easton EA70 wheels and Continental GP4000S tires. It seemed the perfect mate for a long day in the saddle. The first 12 miles took us to the Trek Bicycle headquarters where we stopped to re-fill the bottles, grab a cookie and banana, and take a quick tour of the shrine constructed with Lance Armstrong's Tour de France Bikes. It was fun seeing his 2001 bike again from the year Bryn and I were there. After 20 miles, we buzzed through the rest stop, feeling ok. The wind and hills were beginning to take their toll, but Ed and I were ok, and Jeff was following wheels fine - so far so good. By the Mile 30 rest stop fatigue was setting in. The clouds were heavier and the wind brisk. I began to wonder how I'd do with over half the ride to go. But, knowing I'd survived some epic rides in the past, I was confident in my ability to survive. Such misplaced confidence. Around Mile 40, Jeff made the decision to just do the 45 mile route and turned off. I debated it in my head strongly. Ed was clearly the strongest, even though he'd not ridden the road since breaking his collarbone in an August crash. Could I hang? Surely I could. Surely. Several miles later I saw the folly of this bravado. I stood on a climb and realized that I was cooked. I literally had nothing left to give my legs. I could feel the beginnings of cramps as I plunked back down on the saddle. Oh crap. I had 23 miles to go and I was blown. At the next rest stop I downed Gatorade and a banana along with a few cookies. I was hoping that the influx of electrolytes and calories could stop the inevitable. As we rolled out to face the last 15 miles, Ed found he'd punctured. I was happy to have more time to try and recover. We fixed his flat quickly and then set out. The suffering began in earnest. I was literally counting down miles, alternating my gaze between Ed's rear wheel and my cyclocomputer that fed me the bad news - 14 miles to go, 13 miles .... I was hurting at a level that would place this ride in my Top 5 of suffering on a bicycle. Last year's Chequamegon Fat Tire Festival had set a high bar, but this "ride" was literally tapping every ounce of strength and courage I could muster. I wanted to sit down in the ditch, maybe have a cry. My cell phone battery had died as I tried to map the route and so if I lost Ed I'd have no way to call Kim to bail me out. I dug deeper into what Paul Sherwen famously calls my "suitcase of courage". I was feeling muscles in my legs starting to cramp that I didn't know existed. Ed's wheel grew a bit more distant. He'd sense my growing gap and ease off a little. We passed a slower group and I fantasized not about the riding behind the pretty girls, but rather just riding at their slightly slower survival pace. The riders we passed were suffering as I was. The last 10 miles saw shattered riders, hollow eyes, grunts of acknowledgment. It was hell. Finally I could see the Lake Mills water tower and hope was restored. I saw 2 miles remaining on my computer, Ed's wheel was still ahead. We rolled through town, a blur. Tyranena Brewing appeared. We pulled in and found Ed's wife Nancy, who had survived the 30 mile route. We got food/beer coupons and then ran into Jeff, Kim and Jan. I asked Kim if she'd brought the XTerra rather than walk the mile from the motel. She looked at me if I was crazy. She didn't understand at the time that I didn't think myself capable of riding one more solitary mile. Thankfully, Ed & Nancy gave me a lift back to the motel where a shower restored my flagging spirits. We enjoyed the beer garden and great Tyranena beers - their staff and volunteers did an exceptional job of taking care of the large number of riders. They really put on a great party. Eventually we ended up back at the Pyramid Motel (and Liquor Store) and got a 20" pizza from the neighboring Pizza Pit (that shares a building with a car wash, but admonishes you not to ask for change for the wash at the pizza pit). The pizza took 15 minutes to bake and 7 minutes to completely consume. Even after food at the brewery we were famished. It was an epic day in the saddle. Definitely a Top 5 which puts it in league with a ride in the Alps, Chequamegon, and the 1994 Swedish Day's Metric Century where I ran over my brother Stephen. But, you know what, for all of the agony, suffering, and pain, I'd do it all again. I'd posted this, thought about it for awhile, then realized that I'd not said anything about the beer and the title of this column is indeed Kevin Butler's Beer & Bikes. It had been a lot of bikes, and little beer save mentioning the great folks at Tyranena. I have to give a very big thumbs-up to their Painted Ladies Pumpkin beer - it may be the best pumpkin beer I've had. As a lover of pumpkin, I've tried quite a few and had just had a Buffalo Bill's Pumpkin the night before the ride. Tyranena's Pumpkin is like liquid pumpkin pie - it is fabulous. I also managed to taste their Oktoberfest which was good, Rocky's Revenge with 40% aged in bourbon barrels - yummy, and the Chief BlackHawk Porter quite good, too. Overall, if you find yourself near Madison, Lake Mills and Tyranena is worth the 20 minute or so drive!